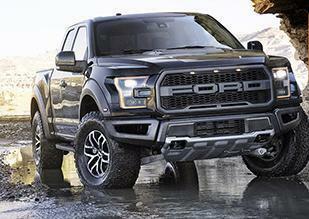 The 2017 Ford F-150 Raptor is a lean, mean, off-roading machine that can take on any terrain with power and style. 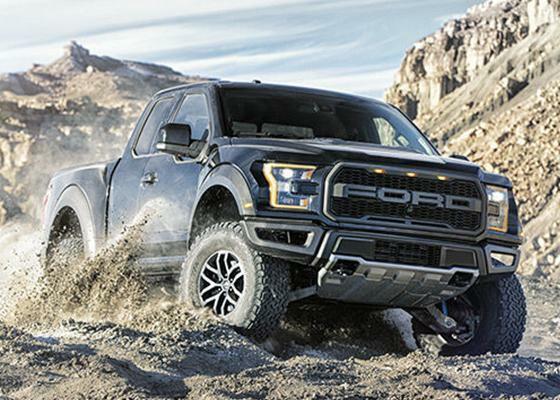 Available in two cab sizes — the 133-inch-wheelbase SuperCab and the 145-inch SuperCrew — every Raptor features 4X4 drive, a fully boxed steel frame, 5-1/2 foot box, and a high-strength, military-grade aluminum alloy body that is 500 pounds lighter than previous iterations. The large-scale, block letter "FORD" logo grille with integrated marker lights create an audacious and unforgettable presence on the road. As are all Ford trucks, the 2017 Raptor isn't just Ford Tough, it is also comfortable and stylish. 10-way power driver and front passenger bucket seats, a center flow-through console, unique bolsters, and perforated leather-trim ensure a pleasurable ride. The 2017 Raptor also is equipped with a leather-wrapped telescoping steering wheel, Ford Performance aluminum scuff plates, Interior Color Accent package, and available carbon-fiber package. 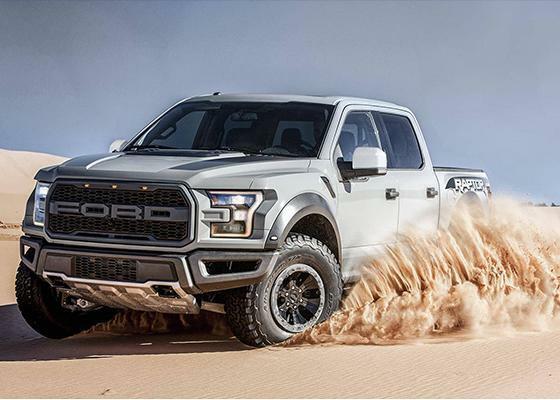 Because going off-road requires power and performance, the 2017 Ford F-150 Raptor comes standard with a high-output 3.5-liter twin-turbocharged and intercooled DOHC 24-valve V6 EcoBoost engine with auto start/stop. This powerful but economic engine produces 450 horsepower and 510 lb.-ft. of torque with a Torque-On-Demand transfer case that manages the power distribution between the front and rear wheels. To keep you in complete control, drivers get a 10-speed automatic transmission with manual-shifting mode and the all-new Terrain Management System, which allows you to pick from six preset modes to optimize driving dynamics to environmental conditions. The 4.10 front axle with TORSEN differential makes off-roading easier by transferring torque to stable wheels before slippage occurs. Drivers also get standard 3.0-inch FOX Racing Shox with custom internal bypass technology. The last pieces of the performance puzzle are the 17-inch BFGoodrich All-Terrain T/A KO2 tires that were specifically designed for the 2017 Ford F-150 Raptor. Owners of the 2017 Raptor have an exclusive opportunity to learn more about this exciting truck with free training from Ford Performance Racing School instructors in controlled off-road environments. 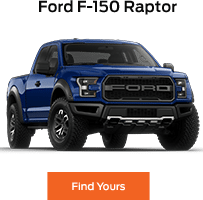 In order to give you the best, safest, and most connected driving experience, the 2017 Ford F-150 Raptor includes the latest technological advances and features. 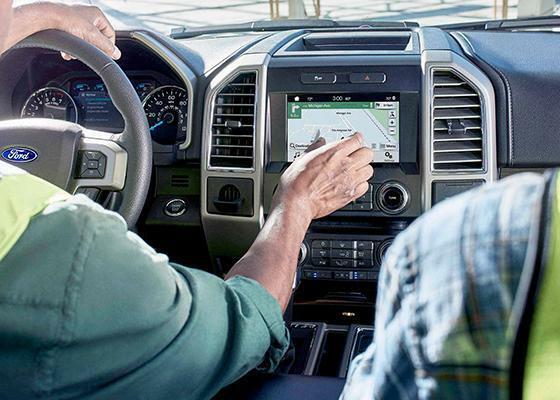 The interior of this off-roading superstar includes a standard 4.2-inch productivity screen in the instrument cluster and an available eight-inch productivity screen that provides useful information from fuel consumption to towing data, thanks to the customizable “MyView” home screen. 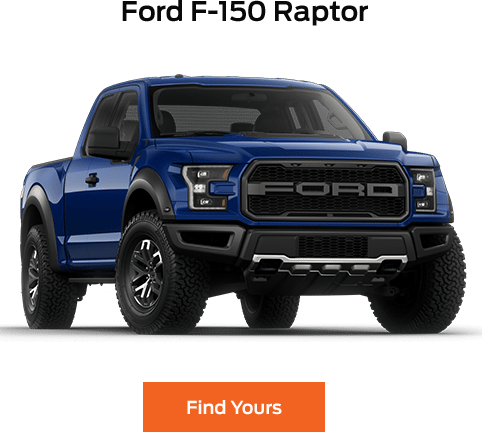 To help you arrive at your destination and keep you entertained during your adventures, the 2017 Ford F150 Raptor comes with SYNC 3, SYNC with AppLink, SiriusXM Satellite Radio, as well as available voice-activated navigation and SYNC Connect.